There’s already a huge amount of innovation in virtual reality and immersive storytelling—with many newsrooms experimenting and succeeding in the field—but for some, the ability to create 360 content can still be limited. Perhaps predicting the rise of 360 technology, in 2014 Australian creative agency Grumpy Sailor worked with Google’s Creative Lab in Sydney on an experiment called Story Spheres, which stitches together photos and audio. It allows journalists, documentary makers and educators to tell powerful stories if they don’t have access to video. Working with the same team behind the first prototype, the Google News Lab is now supporting the next iteration of the project. Today new features will help publishers—from individual journalists to large newsrooms—create and brand their immersive audio experiences. A new website will help journalists brand their creations with their own logos, help them credit their work and embed it on their own website. It’s now even simpler to upload a 360 image, edit the imagery, add an audio layer and navigate from one experience to another. In the UK, Trinity Mirror has already experimented with the new tool: The Liverpool Echo took their readers through the famous dockyards of the city, and the Manchester Evening News provided a snapshot of the flowers and balloons placed in St Ann’s Square as a tribute for the Manchester terrorist attacks. In Norway, Nettavisen has been experimenting with the tool by giving their readers a glimpse at the best podcasts for their readers this summer. 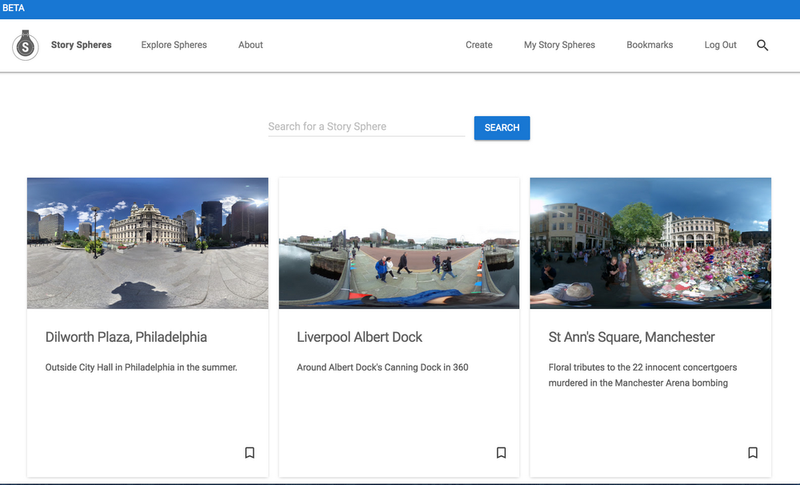 Emily McCartney, a coder and “techxplorer” at Grumpy Sailor, says the improved tool will help users, too: "There's so much news to consume, and people want to be able to jump between stories without losing any time, and Story Spheres help you do that." Discover the tool for yourself, made by Grumpy Sailor with the support of Creative Lab in Sydney and the Google News Lab.